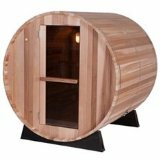 Building an outdoor sauna? Here are some steps to consider before you get started. Recently we featured an article about outdoor saunas which gave you some tips about selecting one that’s right for you. But what about the technical details, or the building’s location, and when must you bring in a licensed professional to help? Here are five steps you can plan for to make your outdoor sauna building project an easier and less stressful experience. You’ll want to build the sauna closer to the house if you live in an area with harsh winters. If privacy is an issue, consider the view the neighbors will have of your sauna area. If you are building an outdoor sauna for recreational use, locate it near the pool deck; if it is for therapeutic reasons, you’ll likely want it located in a more secluded and quiet area. Do not build your sauna within 10’ of overhead power lines. Leave enough access space around the outdoor sauna so that you can get to all sides for repair or building maintenance. Ideally, leave 1 1/2 feet of space on all sides. Consider the dimensions of the gate or pathway to the back or side of the house. If you are having a modular unit delivered, will there be any obstacle to getting it to your desired location? The installation of your outdoor sauna must meet all city and local safety codes, particularly if this is to be a wood-heated sauna. Check with your local building department and secure the required permit before beginning the work. Hire a license electrical contractor to install any electrical circuit. 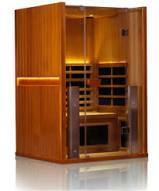 Infrared and electric sauna heaters are either 240V or 120V. 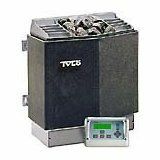 The 240V saunas must be hard-wired to the power supply; a 120V sauna can be plugged into a dedicated grounded outdoor outlet and must not share a circuit with other appliances or lights. 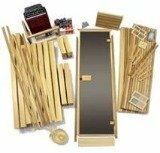 Check the weight of your planned outdoor sauna kit and also consider the weight of 4, 6, or 8 adults who may be using it. The foundation should be built level and able to support the weight. Not only will an improper foundation void your warranty, but any shifting or settling could damage the structure. A 3” slab of concrete is ideal, but if you plan to build it on a wood deck, again, you must consider the potential weight of the sauna and users combined. Uncrate the panels and parts and make sure everything is identified and ready before you begin. Follow the step-by-step building instructions to assemble the benches, attach the doors to the front panel, the walls to the floor, and the roof top panel to the wall panels. Then install the trim, heater, lights, and vents. Breaking in the sauna. You should run the sauna heater for at least an hour to break-in the stove and woodwork before you use your outdoor sauna the first time. Follow these five steps to building an outdoor sauna and you will get the project done right from start to finish.